outstanding new institutional buildings that deserved center stage. Now there’s a bit of breathing space and it’s time to catch up with the wonderful contemporary domestic architecture that’s appeared on the scene. Just upriver from the Mississippi River levee dogpark, a striking pair of contemporary structures rises unabashedly above the rooflines of the historic Black Pearl neighborhood. The structures are a pair of duplexes, the larger one including the residence of architect and builder Byron Mouton and his wife Julie. Taking maximum advantage of the extraordinary site, the design consists of an “upside-down building” strategy. That is, the living spaces are on the top of the three-story mass. In an unusual planning strategy, the larger building is a side-by-side duplex separated by a stair. On one side is a two-story rental unit. The owners’ unit has service on the ground floor and bedrooms on the second. The stair rises through the center of the building, arriving at the top floor facing the neighborhood. As you turn into the living and dining spaces that extend across the entire building, the breathtaking view comes into focus. Inevitably, one is drawn to the framed porch, and the drama of the “mighty Mississippi” is revealed. Here that drama is no longer a cliché, but rather the culmination of a carefully orchestrated sequence of spatial experiences. One of the surprisingly pleasant aspects of the project is the site planning. Entering through a fence, the precinct is marked by thoughtful design. While the gray siding is a familiar New Orleans treatment, an unusual aspect is that the typical garage is instead an open breezeway, perfect for gatherings at which the architect’s skill with the culinary arts is often on display. The renovation work was designed by a collaboration of Steve Jacobs’ friends and colleagues: Architects David Keiffer, Michael Cajski and Van Tran with consultation by Michael Nius. A vertical shotgun” is the way the late Steve Jacobs characterized the design of his Carrollton house. Essentially it’s three rooms stacked atop one another: the living and dining room on the ground floor with a level of studio space and a level of bedroom above. A stair and storage wall separate the primary spaces from the kitchen on the first floor and the bath on the second. The street façade is opaque and rather mysterious, except for an inset porch on the top level with the roof structure floating above. The garden façade is the opposite: a framed wall of glass rising from the ground to the top of the house. The entrance is on the side, under an aedicular folly that shelters the doorway. Before Professor Jacobs passed away earlier this year, he bequeathed the house to the Tulane School of Architecture to be used as a residence for visiting faculty or guests. This required some transformation and completion of the project. Architect David Keiffer was commissioned to oversee the work, and he enlisted Volume Zero as associates on the project. The results are outstanding. On the exterior, a new rear patio successfully links the building to its site. Inside the new kitchen and bath are handsome, with subtle flush surface detailing of dark stained cherry millwork. The middle level is a studio and home office, originally a sleeping loft, projecting over the living room. The top floor is a commodious bedroom with an expansive view of the treetops beyond. In the bedroom and on the adjacent porch, the precise and intricate details of the steel roof structure are a joy to behold. Lee Ledbetter & Associates were the architects; Lee Ledbetter, principal with Tara Cotterman and Will Soniat. This is a substantial new house that’s so skillfully integrated into the neighborhood that it’s scarcely visible. The clients wanted “a secret house,” and this is what they have! From the street one sees an old bargeboard Creole cottage that seems almost ghostlike. However, upon entering the gateway to its left, a new world emerges. A pool forms the central element of a courtyard. 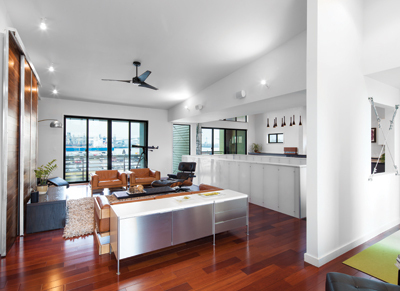 Ahead is the transparent façade of the living room, and to the left is a service wing that extends into a large open kitchen. Moving farther into the court, the back of the cottage is revealed to be a transformed guesthouse, also with an all-glass vista into the court. Upon entering the living room, the generosity of scale becomes evident. The side wall holds the hearth. Opposite are freestanding cabinets that encase the television and electronics and provide some separation from the dining area. The project is marked by a series of horizontal metal screens that sometimes act as exterior shading devices, sometimes as spatial boundaries and sometimes as railings. These provide a consistent counterpoint to a variety of other design elements, notably the voluptuous walnut stairs. The most special aspect of the house, glimpsed from the neighborhood and the river levee, is the third floor porch deck. This perch with its panoramic view was a high priority for the owners. The reward for climbing the enclosed stair is more than a breath of fresh air. Architect Michael Nius has designed and developed a prototypical 21st century house that also draws upon our traditional 19th century house typologies. What is new is the extraordinary amount of efficiency in the dwelling. First, this is a compact house that has almost no unusable space and the rooms are designed to be occupied in a variety of ways, as in the shotgun and Creole cottages of the past. Secondly, the monopitch roof provides a generous surface for photovoltaic panels, and when combined with insulation and a state-of-the-art mechanical system, the house consumes virtually no outside electricity. Finally, the materials of the house have been chosen for durability and are used in their full modular dimensions, reducing construction costs and waste. Most importantly, the house is delightful. Every room has daylight coming from at least two directions, minimizing glare and affording the opportunity for ventilation through the operable casement windows. The spaces connect well to each other. Particularly appealing is the screened porch that extends through the long wall of the house opposite the kitchen. The porch connects visually with the street as well as the side and rear gardens. The house is unified by its ubiquitous dark flooring of carmelized bamboo, recalling the traditional New Orleans dark floors of pine, while providing increased resiliency. Located on a quiet street with a lush landscape near Tulane and Loyola Universities, the house is designed so that it could be replicated, perhaps with variations, in lots around the city. Tom Holloman, designer . John P. Klingman is a registered architect and a Favrot Professor of Architecture at Tulane University. His recent book, New in New Orleans Architecture, featuring 80 outstanding projects over 15 years, from Pelican Publishing Co., is available at local bookstores. In a suburban setting it’s rare to find adjacent houses that relate to each other rather than vying for “curb appeal’ in a variety of stylistic modes. This is the first thing that sets the Cuddihy Drive houses apart, but there’s more that brings them together. First, a bend in the street allows the sides of the houses to generate an angled shared courtyard while each remains perpendicular to the street. The design arose from a client who needed a single family house, but also a unit for his mother. Since two-family houses are not permitted, the two lot solution worked well. The site had flooded in the aftermath of Hurricane Katrina, and the previous construction had been demolished. What remained was a beautiful, sculptural live oak near the street. Respecting the tree produced a strategy that placed the smaller house behind it and the larger one to its left. The placement and massing of the buildings is perfect; they’re also linked by the unusual and elegant dark cumaru wood siding. Inside the larger residence the strategy plays out in terms of transparency and connection to the court between the buildings. From the front door one proceeds along a hallway past service elements, the stair to the childrens’ domain and the entrance to the master suite, to arrive at the living space with full-height windows and sliding glass doors opening to the courtyard and its pool. Here the mood is a juxtaposition of rugged, with a concrete floor, and refined, with an ample kitchen and a beautifully designed breakfast bar. Through the glass one sees the dogs playing and an impressive stand of bamboo in the court that provides welcome shading from the morning sun.